This morning has seen the publication of the sixth CSO residential property price indices forIreland. The inaugural series was published by the CSO on 13th May 2011 and covered the period from January 2005 to March 2011. This morning’s release covers the month of August 2011. 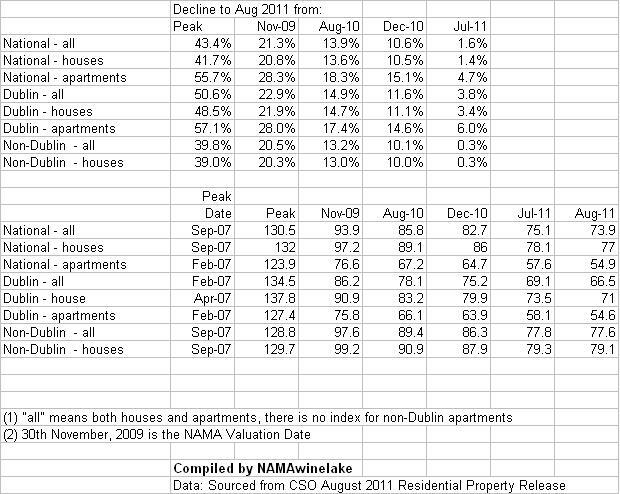 Here’s the summary showing the index at its peak, November 2009 (the NAMA valuation date), August 2010 (12 months ago), December 2010 (end of year, start of this year) and August 2011. Now that the Permanent TSB/ESRI has abandoned its quarterly house price index, the CSO isIreland’s premier index for mortgage-based transactions. Mortgage transactions at eight financial institutions are analysed : Allied Irish Banks, Bank of Ireland, ICS Building Society (part of the Bank ofIrelandgroup), the Educational Building Society, Permanent TSB, Belgian-owned KBC, Danish-owned National Irish Bank and Irish Nationwide Building Society. The index is hedonic in the sense it firstly groups transactions on a like-for-like basis (location, property type, floor area, number of bedrooms, new or old and first time buyer or not) and then assigns weightings to each group dependent on their value to the total value of all transactions. The index is an average of three-month rolling transactions. I don’t think the CSO would be happy with this approach but it seems to me that the PTSB/ESRI series as represented by its historical indices closely matches the performance of the CSO indices. What’s surprising about the latest release? Although the monthly decrease of 1.8% is elevated, we have had similar declines in recent months. What is astonishing is that Dublin prices overall declined by 3.8% in just one month, with apartments down an almost incredible 6% in just one month. Outside Dublin prices declined by just 0.3% in August 2011, which is modest and tends to contradict an expectation that the pace of falls outside Dublin would pick up to match the already-steep declines in Dublin. Are prices still falling? Yes, and the 1.6% drop in August 2011 was more than the 0.8% decline in July 2011. How far off the peak are we? Nationally 43.4%% (also 43.4% in real terms as inflation has hardly changed since 2007). Interestingly, as revealed here,Northern Ireland is some 45% from peak in nominal terms and 52% off peak in real terms. Are forbearance by mortgage lenders, a draconian bankruptcy regime and NAMA’s (in)actions distorting the market? Or are cash transactions which are not captured by the CSO index so significant today that if they were captured, the decline in the Republic would be even greater? How much further will prices drop? Indeed, will prices continue to drop at all? Who knows, I would say the general consensus is that prices will continue to drop. Whilst not lending itself to the format of analysis in the table below, both Anglo chairman Alan Dukes and Danske-bank unit, National Irish Bank have both indicated declines in the immediate future. This is what I believe to be a comprehensive list of forecasts and projections for Irish residential property [house price projections in Ireland are contentious for obvious reasons and the following is understood to be a comprehensive list of projections but please drop me a line if you think there are any omissions]. What does this morning’s news mean for NAMA? The CSO index is used to calculate the NWL Index shown at the top of this page which aims to provide a composite reflection of price movements in NAMA’s key markets since 30th November 2009, the NAMA valuation date. Residential prices are now down 21.3% from November, 2009. The latest results from the CSO bring the index to 853 (17.3%) meaning that NAMA will need see a blended average increase of 17.3% in its various property markets to break even at a gross profit level. Paddy McKillen v. NAMA – the legal costs. Is the final bill really €7m? Paddy McKillen, the “one that got away” from NAMA’s clutches – at least in part -is in the news today with a report in the Irish Times on a French project involving Paddy which has been rumbling on for ten years. The development of 600-acres in southernFrance close to the French Riviera is amply described by the Irish Times’ Frank McDonald with a focus on the architectural aspects of the development with almost nothing to say about the villas that the site will host. In a background note, Frank refers to the recently concluded Irish court battle where Paddy succeeded in keeping most of his loans beyond NAMA. Without citing sources Frank says the case “has left the State facing an estimated €7 million in costs”. Seven million euros! Deputy Doherty: What was the legal bill picked up by NAMA in the Paddy McKillen case? How much did that case cost NAMA? I want the cost involved including the amounts paid to advisers and experts, the division of employee time, and the amount that NAMA contributed to Paddy McKillen’s costs. Who is responsible in the delegates’ view for NAMA losing the case? Who was responsible for taking the view that a decision had been made validly at NAMA on the transfer to NAMA of Mr. Paddy McKillen’s loans before the agency had even been incorporated? Has anyone at NAMA or any of its advisers faced penalties as a result of the losses incurred in the Mr. Paddy McKillen case which it has been speculated cost between €2 million and €4 million? NAMA CEO : The Deputy raised the issue of costs involved in that case. We are still waiting for the costs on McKillen’s side to be submitted to us and the matter will go to the Taxing Master in terms of seeking to reduce them. The costs on the NAMA side were not significant because we did a good deal of the work through the Attorney General’s office and the Chief State Solicitor’s office and, with the agreement of the Attorney General, we only used external counsel and legal firms where necessary. Now the Paddy McKillen case effectively ended on 15th July, 2011 when NAMA decided not to acquire the remainder of Paddy’s loans. Indeed you might say the legal case ended on 12th April, 2011 when the Supreme Court issued the second part of its 2-part judgment. But even from 15th July, 2011 to 9th September, 2011 when the Oireachtas committee held its hearing, eight weeks elapsed. A prominent member of the 27-member Oireachtas committee asked for the cost of a significant legal case and is told that NAMA’s own costs “were not significant” and that NAMA is still waiting on Paddy McKillen’s costs. Reporting after the 15th July, 2011 lobbed various estimates of costs into the public domain. RTE did in fact report an estimate as high as €7m in July 2011, but other lower estimates were also bandied about. The Irish Times report today reminds us of the €7m bill, which is a significant sum of money. It is to be hoped that the Oireachtas committee writes to NAMA and instructs the agency to provide the breakdown of costs when it become available – what status does an oversight committee have in our country if a relatively straightforward question is met with the response above, and then left at that. The NAMA CEO reminded us on 9th September that NAMA won on two of the points at issue though lost on two others; one might wonder why NAMA is seemingly picking up 100% of the other side’s costs if the ultimate result at the Supreme Court was a 2-2 draw. There is a dedicated page given over to the Paddy McKillen v NAMA case here.